The building of a flood barrier in Limerick will begin ‘immediately’ Brian Hayes says. WORK WILL BEGIN ‘immediately’ on a temporary flood barrier to help protect vulnerable homes in Limerick, the Minister of State at the OPW has said. Speaking tonight in the Dáil, Brian Hayes said that OPW will fund the barrier that is aimed at better protecting the Kings Island area of the city and that work will begin as soon as possible. Responding to concerns from two Limerick TDs – Willie O’Dea and Kieran O’Donnell – Hayes said that the devastation that he had witnessed was “heartbreaking”. He welcomed the announcement from the Taoiseach that €15 million in humanitarian aid would be made available to those affected by the weekend’s flooding. Both Limerick TDs called for action from the Government on the flooding, with O’Dea summing up the scene. My constituents woke up at the weekend to their own personal Dante’s Inferno. Email “Limerick floods were 'like Dante's Inferno'”. 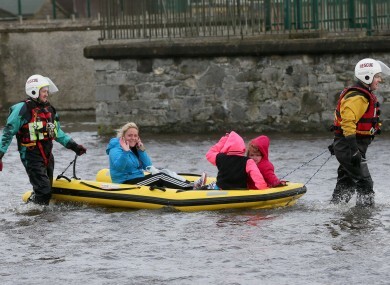 Feedback on “Limerick floods were 'like Dante's Inferno'”.